Our Premium 2" Cordless Basswood Blinds come with a cordless lift system to raise and lower the blinds without a pull cord. Simply raise and lower the bottom rail and the blinds hold securely in place. Increased Child and pet safety. Tilt the wood blinds with a tilt cord. Color matched to our Premium 2" Basswood Blinds using the same wood slats. Because larger windows are too large for the cordless lift, match with the Premium 2 Inch Basswood Blinds. Buy your cordless basswood blinds today! And wondering if you have any wood blind that I could get cordless and smart privacy upgrade? 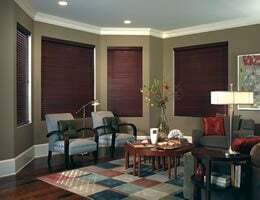 If you order a cordless blind, you will not have an option to have it with smart privacy upgrade. Unfortunately none of our manufactures offer both options together.